So I thought I would try my hand at the No Knead Bread again today. Aidan was "helping" me. He got so excited to eat bread (and the No Knead Bread won't be ready for another decade) that I decided to make my famous Beer Batter Bread. Well, it isn't so famous outside of my immediate family (that being me, Jeff, and Aidan--the cats haven't even tried it). It is quick, easy, and tasty! Preheat oven to 350. Combine flour and sugar. Add entire can of beer and stir until just mixed. 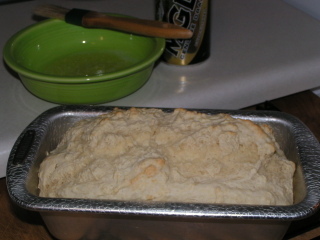 Pour into greased bread pan. Bake for 40-45 minutes or until top starts to turn golden brown. Pop out of bread pan and brush with melted butter. Let cool a little before slicing and serving with dinner. ** Eat it all. *If you don't have self-rising flour, you can make it using All purpose flour, baking powder, and salt. For every cup of baking powder used, add 1 1/2 teaspoons baking powder and 1/2 teaspoon of salt. **To the right is dinner. 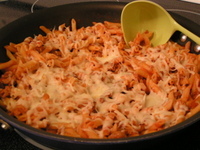 It is a little goulash consisting of mini penne noodles, tomato puree, ground turkey breast, Penzey's Pizza Seasoning and some Mozzarella cheese. YUM! Boy that looks good-enough that it would make me feel better and get over this darn cold or whatever I have. Yum, both sound delicious. A microbrewery\restaurant in town had a nice beer bread and served it with a hot artichoke dip - I may have to try this bread and serve it up with some.... making me hungry as we speak!